Is leadership development a top concern at your organization? If so, you’re right there with the majority of American companies. Building succession plans is a critical task at every company, yet very few are prepared to replace leaders when they’re lost. Although the age ranges of generations are not hard and fast, it’s safe to say that many of your company’s leaders in the next 10 to 15 years will be millennials. A lot of people still see millennials in their minds as college students or just starting their careers, but the reality is that many of them are well into their thirties, mid-career, with plenty of experience under their belts. Not to mention, they’ve already become the largest generation in the workforce. Every company that wants to be in existence 10 years from now has to look at how well they’re developing their next generation of leaders. Considering how much the millennial generation values professional growth and development – 87 percent say it’s important in a job – the way you train them for succession has to look different than it did 10 or 20 years ago. If you’re not using modern methods, these high-potential leaders are going to recognize pretty quickly that their future would be brighter with a different company. So how do you identify your high-potential, next-generation leaders and prepare them to be highly successful leaders in your organization? Which leadership roles do we expect to open up within the next five or 10 years? Do we have any C-suite or hard-to-fill roles that may open up? Are there any leadership roles that may need to be created within the next five or 10 years? Once you’ve identified these roles, you’ll need to determine the qualifications, skills and characteristics that will be most important for someone to be successful in those positions. Some of these may be present in your current leaders, but some may be more crucial in the future than they are with today’s leaders. Certain qualifications may not matter in the future, or some characteristics may be more important than particular skills down the line. Decide on these must-haves (not nice-to-haves) and create milestones for the potential leaders who will be in the succession plan. Doing this helps you to create a picture of the person who would be ideal for this role, so you can match high-potential employees by characteristics, and work on developing their skills before the need arises to fill a critical role. The next task is to identify your high-potential employees – your best candidates for progressing into these leadership roles. The preferences, habits and expectations of your millennial employees may look much different than the way your current leaders work, so it’s important to understand the general motivations that drive these potential leaders. Kimberly Fries says in a Forbes article, “Millennials seek leadership positions to empower others and to create change. Only a very small minority do so for compensatory reasons or to establish a legacy.” Fair compensation matters, of course, but it’s not the primary driver for climbing the ladder. Most of your millennial employees expect leaders to be change agents that make the world a better place, so that’s what they strive to be themselves. So, when you’re keeping in mind these motivations, how do you then identify your high-potential employees for leadership? Your high potentials (HiPos) may also be high performers, but one does not necessitate the other. Some of your highest performers are fantastic in their roles, but they may not be effective at leading people or possess the aspiration to be a leader. And that’s OK – you still need them. You’re not looking to turn the entire company into potential leaders. High potentials may also be high performers, but one does not necessitate the other. On the flip side, your HiPos may not be high performers in their current roles. Perhaps they’re in a role that doesn’t match their strengths, or they’re unmotivated because there is no path to leadership. Don’t be afraid to be transparent about succession planning. In fact, millennials will especially appreciate seeing that your company is invested in creating development opportunities and paths to leadership. You can use assessments to help identify your HiPos, based on those characteristics you’ve already defined. Just make them as measurable as possible to keep the process fair and unbiased. For things that can’t be measured, have multiple people weigh in. Once you’ve identified someone as a high potential, tell them! You need to ensure that they’re on board with working toward a leadership role, and if they are looking to be a leader, they’ll be more inspired and loyal to your company when they know you have plans for their potential. The caveat here is that you shouldn’t make concrete promises for a particular role in a set amount of time because things may change. Keep them in the loop about the organization’s plans for them, but don’t make promises you can’t keep. If you’re worried about an identified HiPo thinking they’re set for leadership and slacking off, make sure they know you expect them to reach those milestones you’ve set to continuously prove they’re still committed to the plan. Again, remember millennials’ motivations. They’re typically not after a certain job title or status within the company – it’s about the level of responsibility and opportunities to lead the organization into changes for the better. If an official leadership role isn’t opening up for them, be creative about how they can channel their abilities. Ask them what opportunities they see for improvement in the organization. Having a voice and the chance to drive positive change is mutually beneficial to the company and the high-potential employee who’s not yet in the C-suite. Helping your HiPos develop their leadership skills is most effective when you use multiple channels. Seminars and group trainings can be helpful, but they aren’t personalized enough to be the basis of building strong leadership skills. The days of annual performance reviews are waning. In many organizations, yearly discussions are being replaced by monthly or weekly coaching meetings with managers. This is sometimes attributed to millennials needing “hand-holding,” but it really just means they want confirmation that they’re doing high-quality, valuable work. HiPos who are coached by their direct manager will be better prepared to coach others and bring about better business performance. Mentoring is different from coaching because a mentor will likely not be the direct supervisor of their mentee. Setting up mentorships between your experienced leaders and each of your HiPos is a highly effective way to ensure your organization is prepared for transitions. High-potential millennials are constantly looking for ways to improve in their work and make a bigger impact. Providing them with high-quality, on-demand learning content gives them the ability to choose which skills they’re going to work on and fit that training into their day-to-day work. To effectively develop your HiPos for leadership roles, the training you provide should fit seamlessly into the work they’re performing. 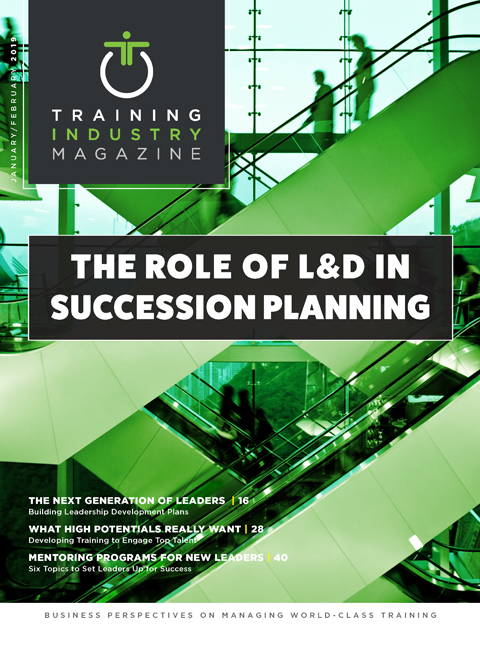 Make sure your company is prepared for succession by incorporating coaching, mentoring and self-directed learning into development plans for your next generation of leaders. Krista Brubaker is a content marketing strategist with BizLibrary. She helps to research, create and enhance resources that are helpful to human resources and learning and development professionals.